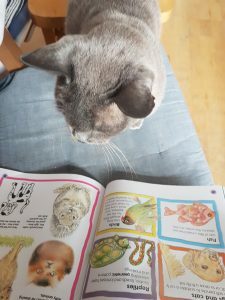 Since last year we’ve been conducting research with clients and have discovered that if you work in book publishing, then it is highly likely that your publishing skills have transferred to your pet, in particular your cat or dog. Following on from these discussions, bookcareers.com will be acquiring a small consultancy called ‘Purr-roofreaders Are Us’ who have been hiring out cats and dogs for a variety of editorial services. We are open to all approaches from publishing staff, Literary Agents or booksellers who have pets with similar traits, although one bookseller they commented their cat ‘showed no interest in books whatsoever’. If you’d like your pet to register with bookcareers.com please do so via social media, using @bookcareers #bookcareers, and providing a photo of your pet either in the process of reading, proofreading or copyediting. You can view our latest candidate list here. PS This was an April fool.